This is a about a half scale version of the numerous dark leafed selections of Physocarpus. The leaves and flowers are petite, making it a great choice for a smaller garden, shrub border, or hedge. 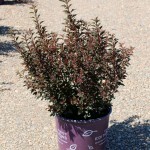 It forms a dense rounded shrub with deep wine colored foliage. 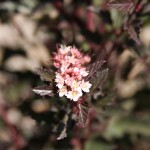 It blooms in late spring with clusters of small pinkish white flowers. PP 22,643.